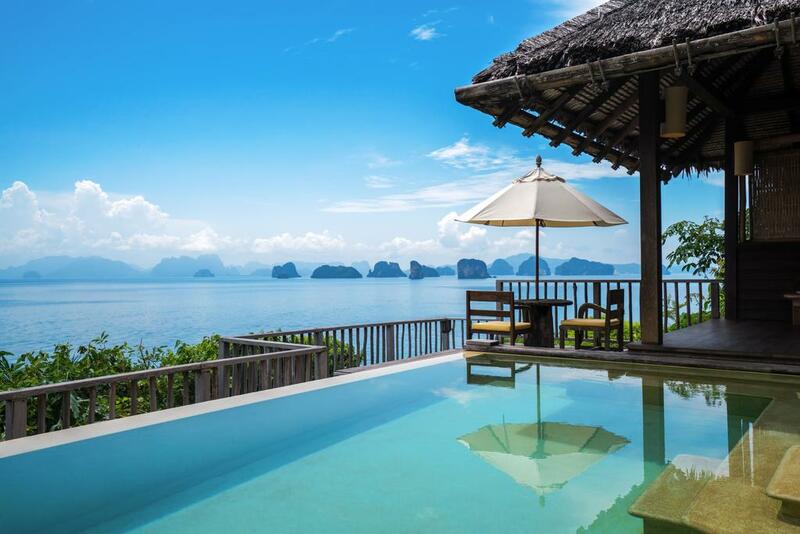 The View, a newly revamped premium one-bedroom villa at Six Senses Yao Noi is now welcoming guests. Ideal for couples, especially honeymooners and those celebrating a special occasion in Thailand, it provides an abode of comfort, exclusivity and space with a touch of fun and quirky elements. Originally created as a celebration venue, the ultra-spacious 2,422 square-foot (225 square-meter) villa now boasts an infinity-edge pool, a pool shack, private cinema, sunken dining area, plus a mezzanine floor and a fitness studio among its new refinements. Stepping into the villa, guests feel in harmony with nature due to the Thai-inspired interiors infused with a contemporary twist. A newly added waterfall is visible though a glass floor in the bedroom as it flows beneath the king-sized bed, connecting the occupants with the soothing sight and sounds of flowing water. Synonymous with its name, The View offers a 360-degree view of the surroundings including a breathtaking panoramic view of the iconic limestone karsts of Phang Nga Bay, which is best admired with a loved one while lazing on the pool’s trampoline net with a cocktail in hand. As all main walls are glass, the ocean, jungle and waterfall can be seen along with the different hues of the sky – from inside or outside the villa. Although a full range of facilities is available in the resort, guests who check into The View may find it hard to leave. Sunrises are spectacular and a ‘get-me-going’ basket, which includes choices from a healthy breakfast menu, are available for early risers who want to be inspired by the break of dawn. In-villa dining for The View also goes beyond the ordinary as lunches can be enjoyed from a floating tray in the pool while barbecue dinners are served by a private chef in the sunken dining area after pre-dinner drinks overlooking a romantic reflection of the sunset on the bay. The pool shack is a cocktail master’s dream, where a ‘cocktail of the day’ mix of ingredients and recipe are sure to inspire. Martini lovers can also make their own – shaken or stirred – and enjoy a perfect James Bond moment. A GEM (guest experience maker) is on hand to personally tailor the guests’ journey throughout their stay. Designed by the talented creative team from Six Senses who are adept at crafting out-of-the-ordinary experiences, together with Six Senses Yao Noi and with sustainability and wellness to the fore, The View is set to be the best premium one-bedroom villa in the region.